YES, PLEASE GET A NEW CUP EVERY TIME YOU NEED A DRINK OF WAT - ProudMummy.com the Web's Community for Mums. 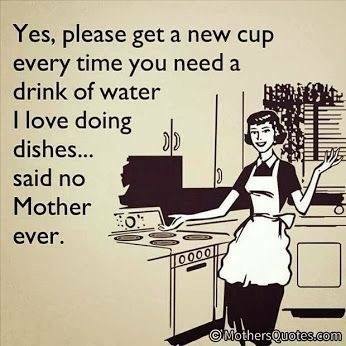 YES, PLEASE GET A NEW CUP EVERY TIME YOU NEED A DRINK OF WATER I LOVE DOING DISHES... SAID NO MOTHER EVER. Vaughan Crocker rinse out your cups!!! Haha Emily Mae Kirk Sean Headington Aimee Kirk Freya Kirk and Simon Kirk wiv yr coffee cups! !